A simple message to bring to school kids, yet it is already proving to be a versatile slogan that has provoked a variety of different responses from the schools we’ve already reached. Through sessions with five different Miami-Dade County area schools, the arts residency team – consisting of myself, violinist Karen Cueva, cellist Patrick McGuire, and cellist Michael Dahlberg) has had the pleasure of engaging these young musicians. Let’s jump into the week so far! 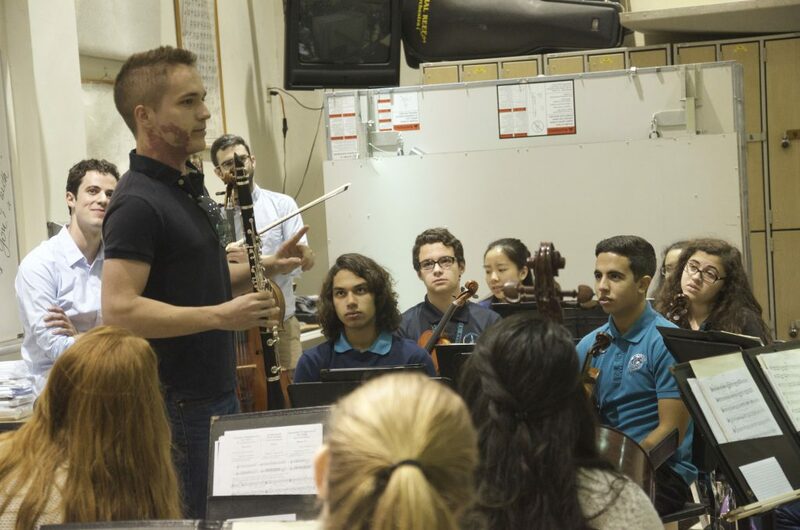 On Monday, we visited Coral Reef High School to work with the school chamber orchestra. The team, led by Michael, challenged the group with our slogan “Love it. Own it. Share it.” Through Mike’s work as a member of From the Top’s Education Team, he was able to reach the group by mixing up rehearsal techniques and having the rest of us talk about our life experiences as musicians. Beyond our effect on the kids we were talking to, I experienced so much growth just being able to listen to what my fellow Arts Leaders had to say on the topic. After a debrief and a discussion of what lay ahead for us the next day, the arts team headed out to Southwood Middle School to have dinner and meet with the music students from that school. Organized by the school principal, this gave us the opportunity to just sit down and talk to these unique kids about what life is like for a kid in Miami. Also, there was popcorn chicken at this dinner. If you want to know the quickest way to my heart, start with popcorn chicken. I attempted to fend off kids and adults alike from the popcorn chicken platter, but decided after a while that this was an unhealthy reaction to the existence of popcorn chicken. More importantly, one particular moment hit us especially: one young boy decided he wanted to interview us individually about our experiences as musicians. These interviews turned into 60 Minutes-style profiles, with this kid probing each of us about our lives. The only way he could be stopped was via the school intercom requesting his presence at the front desk hours after school had ended. So far, so awesome! The pure energy and enthusiasm these kids are showing us so far is so much more than we could have asked for on this trip. As we gear up for a final multi-ensemble performance on Thursday featuring the kids we are reaching this week, I know all of us can’t wait to see what’s in store for us as the week continues!